By Kori ~ July 20th, 2009. 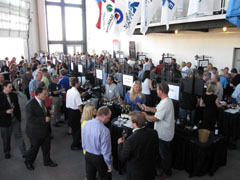 For the second year in a row, Dad (John) and I attended the Rhone Rangers trade/media tasting in Seattle. The Rhone Rangers are a non-profit organization dedicated to promoting American Rhone varietal wines. To be members, wineries must produce wines from one or more of the 22 varietals that are native to the Rhone Valley in France. Rhone Ranger member wineries from Washington, California, Oregon, Idaho, and Colorado participated in this tasting. The Rhone Rangersâ€”Advancing the knowledge & enjoyment of Rhone grapes grown in America and of the wines produced from those grapes. Last year, we focused on Syrah so this year we decided to focus on Viognier and red blends. We tasted a total of 54 wines: 16 Viogniers, 30 red blends, and eight Syrahs. We gave a 4 star rating or higher to ten wines. Our most exciting discovery was the 2007 RÃ´tie Cellars â€œNorthernâ€ Red Blend, a Syrah (97%) co-fermented with Viognier (3%) in the CÃ´te-RÃ´tie style. It is a bold wine, yet exhibits remarkable finesse at the same time. I was blown away by its purity of fruit. 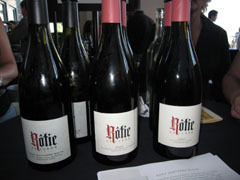 RÃ´tie Cellars, located in Walla Walla, Washington, is a new winery founded by winemaker Sean Boyd. As his wineryâ€™s name indicates, Boyd is dedicated to producing Rhone-style wines from Washington State fruit. If you, like us, are a big fan of Syrah and other Rhone varietals, RÃ´tie Cellars is definitely a winery to watch. The best Viognier that we tasted was the 2007 Bridlewood Viognier Central Coast Reserve. I was a bit disappointed that we did not find more 4-star Viogniers. One thing I noticed was the number of different styles of Viognier, from crisp, acidic, Sauvignon Blanc-like to flabby, oaky, and Chardonnay-like. The Bridlewood Viognier falls somewhere in between those two extremes. It is very aromatic, as a Viognier should be, exhibiting floral, gardenia notes. Melon and peach flavors come through on the palate and round out this light, crisp wine. Hereâ€™s a breakdown of the wines that we tasted at the Rhone Rangers event. Under each Quality heading, the wine name and region will be listed along with price and QPR rating. Wines in bold type received a QPR rating of 5 bangs for your buck (out of 5). I have great respect for the Rhone Rangers organization and I think they are doing an awesome job promoting wines from lesser known varietals grown in South East France. If anything, perhaps they are being too successful and as a consequence are spreading the false impression that all the grapes sanctioned are “native” to the Rhone region of France. From this forum I just want to clarify that some of the most popular varietals are not indigenous to the Rhone and indeed come from the largest vineyard in the world just a few hundred miles south. This applies primarily to Garnacha, Monastrel and CariÃ±ena.